When I grab a snack, I often choose to go the jerky route. A problem I have recently started running into is most jerky has gluten in it. That is not the case with Nick's Sticks by Wallace Farms. Nick Wallace is one of the founders of Wallace Farms, a 100% grass-fed cattle farm located in Keystone, Iowa. He grew up in a town called Strawberry Point… charming, right? Ventured far west for college, landing in Corvallis, Oregon…. Duuude! Got sick (see above) and finished school and chemo in Iowa City, IA…. Whoa! Then had a come-to-Jesus career moment that led to a year of culinary school in Colorado…. Free food + lift tickets = Gnarly! Finally, he returned “Back to the Land” that his great-great grandfather first farmed in 1894. Alleluia! Nick sent us 4 varieties for this review. 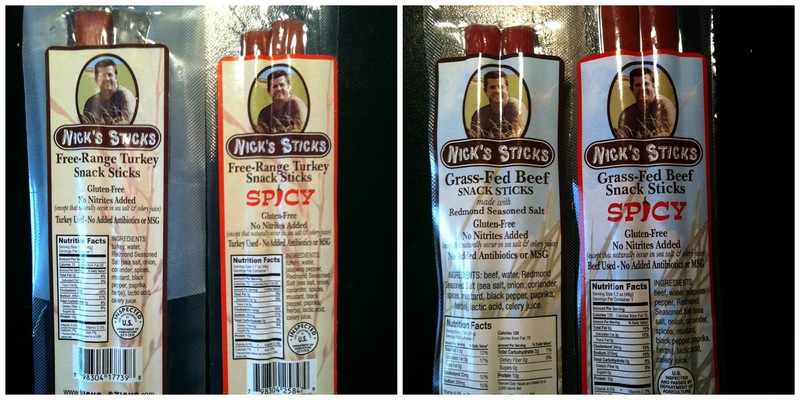 Nick's Sticks offers Grass-Fed Beef, Grass-Fed Spicy Beef, Free-Range Turkey and Free-Range Spicy Turkey Snack Sticks. Each twin stick package has a 1.7 oz weight. The jerky has no sugar, no MSG or nitrates, made with organic seasoned salt and is 100% gluten free. Of all the flavors, the Free-Range Turkey is my favorite. The flavor has a nice meaty, smoked flavor. The turkey sticks were easy to bite into and were overall delicious. The Spicy Turkey sticks were of the same texture and flavor as the Turkey, but had a slight spice to them. Nothing too hot that left me running to have a drink. What's even just a little better, these sticks are 70 calories for 2 sticks! Yummy and decent in calorie! The Grass-Fed Beef sticks were alright, but as I mentioned, not my favorite. They left a slight greasy feeling in my mouth. The flavor was good and texture a little greasy. The Spicy Beef sticks did leave me wanting a glass of water! I enjoyed the spice and noticed I wanted more when the sticks were finished. At 120 calories for 2 sticks, Beef or Spicy Beef, these are not a bad option for a snack. To find out more about Nick's Sticks, check out their website and social media pages. They claim to be All of the Goodness.... None of the Garbage! I agree 100% with their statement! Get some Nick's Sticks and find out for yourself! Disclosure: A special thank you to Nick's Sticks for giving Sweet Cheeks and Savings this opportunity to work with them. We received these items free of charge from Nick's Sticks. No monetary compensation was received or offered, nor were we under any obligation to write about this product. All opinions expressed are honest thoughts. We were not offering any sales or taking orders for this item. We will not receive any compensation in connection with any sales of this item. I have never been much of a jerky person myself, but my kids LOVE it. I love that this brand seems like it would be a little better for them! I've only had jerky a few times in my life. My husband on the other hand likes to have it around on occasion. It's a good thing for me to send in care packages during deployment too as it's easy to ship. I love jerky! It is definitely one of my favorite snacks as well. But most of the time the only options are not even close to being healthy. I will have to check them out! Thanks! I am a huge jerky fan and have been ever since my dad and I made our own when I was in grade school. We love to try regional flavors whenever we travel. I love jerky! It is definitely one of my favorite snacks! I don't eat it as much as I used to because there are not as many healthy options, but I will have to try this one out! It sounds like a much better alternative! Thanks! My 4 yr old LOVES jerky. Seriously. He'd eat it all day if he could. These are right up my alley. Our family loves jerky and we go to a lot of effort to only eat grass fed beef. Yum! I want some! My kids would love these! I like the fact that they offer turkey jerky too. I llllooovvvvveeeee beef jerky. I would love to try this out myself. Beef jerky is one thing I crave often. My Hubs loves Jerky, he takes it with him for snacks when he goes hunting. I have never tried Nicks Sticks, but I would like to. My hubs love beef jerky! He would love the spicy ones!! I have been through Strawberry Point many times on my travels from Wisconsin to central Iowa. I am very familiar with the area. I will have to check this beef jerky out for sure. Yum, I would love to try one of those. I love jerky, it makes a great quick snack. Yum - I love jerky! I also like knowing that this brand is a healthier option. We love jerky, so much so that I make my own. it's great to see companies like this coming out with gluten-free options. I can never hear about jerky without remembering this story. My dad got a dehydrator and used it to make all kinds of jerky- venison, beef and FISH! I don't know if you've ever been in a house where fish was placed in a dehydrator but something like 25 years later I can STILL smell it! Blechhhh! We love jerky around here. I will have to check this company out. Clever name!